Can’t remember if I got back to you or not about our experience in Grenada, maybe because I just had a few shots of that Rivers Rum last night. It’s the real deal! Over the last decade, my wife and I have visited virtually every island in the Caribbean, except Turks and Caicos, St Vincent and Trinidad. Of all the islands we have visited in the Caribbean, Grenada is without a doubt the BEST! We loved it so much we just booked again for 8 days in April. This time we’ll make it to Gouyave Fish Friday for sure! Never been to Grenada but always looking for another beautiful carribean island. I’ve had plenty to Caribs at St. Martin. 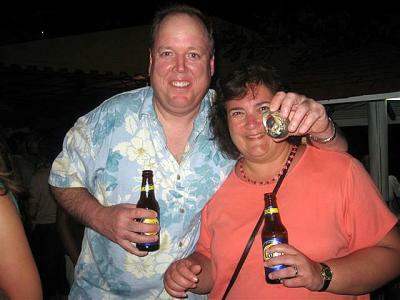 Piton beer in St. Lucia is delicious also. Fill me in on Grenada….what makes it the BEST! no doubt about it Grenada Rocks, and so does Rivers Rum! Just looking at those Carib Beers, and that big smile I can tell you guys had a ball. In fact you got me thirsty just looking at those Caribs. I hope the bookies were kind to you at the Crab Races. Here’s to an awesome next Grenada Vacation.